February 18, 2004: Dr. Elena Tsareva of St. Petersburg Russia: Pazaryk excavations: Jim Blackmon Gallery 2140 Bush Street (between Fillmore and Webster) San Francisco, 94123. In keeping with our on-going series of presentations on Feltmaking we are pleased to be able to present Dr. Boehmer's justly famous film on the Karakoyunlu Yoruk of Anatolia and their Felts. Following the video, running time about 30 minutes, John Sommer and Peter Poullada will lead a discussion about the Yoruks, the nomads of Anatolia and their weaving culture. We strongly encourage that members bring along any examples they may have in their collections of Anatolian nomadic tribal weavings: pile weavings, kilims and of course, Felts. This is your chance to show off that Yoruk piece you bought in the Istanbul Grand Bazaar !! The Karakoyunlu Yoruk belongs to the nomads of mainly Turkmen origin who nomadize in Western, Central and Eastern Anatolia and who even to this day practice a form of transhumant nomadism. The term Yoruk is the common Turkish word for nomads or wanderers. The name Karakounlu is famous for having its origin from a late 14, early 15th century Turkmen tribal confederation that ruled most of Eastern Anatolia and even Western and Central Iran. At their greatest extent they even attacked the Timurid capital of Herat in Eastern Iran. Their name means: " Black Sheep ". Today, in modern Turkey, the Karakoyunlu represent one of the largest Yoruk tribes still in existence, those shown in the film have their summer pastures ( Yayla ) in the central Toros Mountains at a height of 2000-2500 meters and their winter pastures ( qishlak) are on the Turkish coast east of Antalya. The Karakoyunlu Yoruk produce and use decorated felt carpets which they call Kece, as floor covers in their black goat-hair tents as well as in their heavy coats which they call Kepenek. This felt coat provides excellent protection from the rain and cold. For Feltmaking the Karakoyunlu use only the summer wool, not the longer fiber winter shearing. Shearing is usually done in September and the sheep are first washed but the wool fat, lanolin, remains which helps to create the thickness of the Felt. To loosen the sheared wool a bow with a vibrating string is used. The Felting process as seen in the film requres the women of the tribe to roll the packed wool for hours constantly using warm water to moisten and pack down the wool. With the rapid modernization of Turkey in the last 20 years, the traditional nomadic cultures and weaving traditions are gradually disappearing in Anatolia. The film is based on material taken between 1992 and 1997. SFBARS is pleased to announce that Dr. Elena Tsareva of St. Petersburg Russia, will be speaking to our members Wednesday, February the 18th at 7:00 at Jim Blackmons Bush Street Gallery. We apologize for the last minute announcement. Elena Tsareva has been curator of the Russian Ethnographic Museum for many years and is the author of Rugs and Carpets from Central Asia, the Russian Collections, Penguin Books. She is a well known authority on Turkmen weavings. She is going to be speaking on the Pazaryk excavations, and it should be a fascinating talk. We will meet at 7:00 and the lecture is planned at 7:30. Jim will, as well, I'm sure, have wonderful things to look at in his gallery. "The first group of early nomad bags to actually survive comes from the Pazyryk Tombs in Siberia. Because objects in these 5th century BCE Scythian tombs were preserved in permafrost, a great deal can be learned from them. Found in the various sites, according to Elena Tsareva, were “twelve different leather and fur bags, including one saddle bag”, but no woven bags, only scraps of wool cloth that might have been parts of bags at one time.3 The fiber remains include magnificent felt fragments, but no felt bags. To this day, there is a Central Asian tradition of using both leather and felt bags." ELENA TSAREVA is with The Textile Research Programs in the Peter the Great Museum of Anthropology and Ethnography (KUNSTKAMERA)* The Russian Academa of Sciences, Saint Petersburg, Russia (Previously she had been curator of felts and carpets in The Ethnography Museum of the Peoples of the USSR in Leningrad, but in 1991, this museum changed its name to The Russian Ethnography Museum in Saint Petersburg--the SAME museum and the SAME city, but different names. That famous museum contains the central Asian items gathered by Dudin, over a hundred years ago.) Now Elena Tsareva is at a different prestigious museum, The "KUNSTKAMERA", at a different location in Saint Petersburg--"across [the Neva River] from The Hermitage." In our "last minute" announcement we gave Elena Tsareva's subject as "Pazyryk Excavations" BUT she had prepared a special talk just for us and spoke about "FELTS" (including those found in the Pazyryk excavations, now on display in the Hermitage Museum). ELENA TSAREVA, in her talk, touched upon the processes involved in felt-making techniques. The central portion of the immense Eurasian landmass is where felt originated millennia ago. Some of the oldest intact felts are from the Pazyryk Excavations, about 400 BCE. Evidence of even older felts comes from ancient sculputeres, paintings, and desert burials often taking th form of felt clothing. Elena gave us convincing evidence of the widespread making and use of felt in the Eurasian landmass--from Europe to Japan. Wool felt was the first "textile"; one centimeter of felt can separate the outdoors from the interdoors, freezing cold from toasty warmth. Felt has been thought to be magic. The three programs--Melina (and Bamdad) Raissnia (at the Sandra Whitman Gallery), Harald Bohmer's video of Turkish nomads (at the Krimsa Gallery), and this presentation by Elena Tsareva (at The James Blackmon Gallery)--have been a most impressive individually and as a "trio." *Melina and Bamdad Raissnia showed us felts of the highest quality and intricacy being made by older men in an urban setting in Iran. (Many in the western rug world have not known that such felts existed.) They showed us a video of the making of the very felt rugs we were holding in our hands *Harald Bohmer's video of Turkish nomads making felts showed us what many in the rug world had known about. Elena TSAREVA's talk showed us how long ago it was, how excellent they were, and how really widespread felt and felt-making has been throughout all of Europe and all of Asia--information worth remembering. Then Jim Blackmon briefly showed us some excellent felts--some "imbedded= (ala kiyiz), some appliqued, and some "mosaic" (shyrdak). He also did a brief "Show & Tell) of the elegant South American weavings on his gallery walls. *"Art Room." German words are also used in English, e.g., Kindergarten. 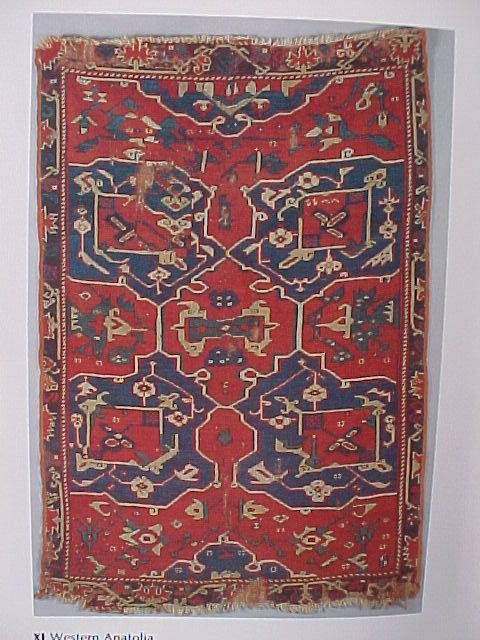 For some examples of the type, see Plates 37 and 38 Vakiflar Museum Istanbul Carpets, by Belkis Balpinar and Udo Hirsh. See also plate 90 in One Thousand Years of Turkish Carpets, by Oktay Aslanapa. CONVICTION OR EVIDENCE? WHAT DO WE REALLY KNOW ABOUT THE HISTORY OF CARPETS? A presentation by Dr. Jon Thompson. Tuesday March 23rd , 2004. At Fort Mason, San Francisco, Building C, Room 210, second floor. Book signing and refreshments 6:30- 7:15 pm.Lecture to begin promptly at 7:15 pm. See separate Book Review (in newsletter) of Dr. Thompson 's book by SFBARS President, Peter Poullada taken from the Journal of the Royal Society for Asian Affairs, 2003. Current thinking about the world of rugs and carpets derives in a large measure from ideas put forward long ago. It is now time to challenge and question some of these assumptions. Jon Thompson who has been studying and writing about carpets for over 30 years will cast a critical eye on such questions as how, where, and when some to the great carpets were made, where carpet weaving began and how it spread, how patterns were transmitted and the origin of some of the well-known carpets such as the Ushak carpets and those we call Mamluk which seem to have come from nowhere. Thompson will look as well at a number of other intriguing carpet problems and will propose how we might usefully take a fresh look at many of the things we take for granted. Dr. Jon Thompson is currently director of the Beattie Carpet Archive at the Department of Eastern Art at the Ashmolean Musuem of Art and Archaeology, Oxford University. He has been writing about and studying carpets since the mid 1970's and is the author and co-author of many famous books especially on Turkmen weavings and carpets of the nomadic tribes of Turkey and Iran. Prior to the lecture, Dr. Thompson will be offering for sale and signature a limited number of copies of his most recent book ( and will be taking orders for delivery for others) from 6:30 to 7:15 PM on Mrch 23rd at Ft. Mason. His book is titled The Nomadic Peoples of Iran, co-edited by Dr. Jon Thompson and Dr. Richard Tapper of SOAS, University of London. Photographs by Nasrollah Kasrian, a famous Iranian photographer of the nomadic peoples. This book documents the life of the nomads of Iran at the end of the 20th century, a way of living that is facing an uncertain future. The 17 essays provide authoritative and accessible accounts of important aspects of the material culture and society of the main nomadic peoples of Iran. The authors include anthropologist, ethnographers, geographers and other specialists who have lived for extended periods with different nomadic groups. Visual documentation is provided by a remarkable set of photographs taken by Nasrollah Kasrian, one of Iran's leading photographers. The combination of an accessible yet scholarly text with high quality photographs makes for a book of rare quality. The Nomadic Peoples of Iran is being offered at this program only for a special price of $95, a 30% discount to SFBARS members off the list price of $135. They will be offered on a first come first serve basis but Dr. Thompson will also take orders ( in cash or by check, no credit cards) for additional copies if the stock runs out. Jim Dixon, SFBARS board member and collector par excellence, has once again generously offered his house in Occidental for our annual get-together in the beautiful green hills of northern California. Jim's vast and important rug collection, featured in Hali 109, is a sight to behold. Visitors will see museum quality pieces in an architectural setting created specifically to display and enhance them. One is overwhelmed by the power of many exceptionally large 16th, 17th and 18th century carpets. These early carpets have been arranged in individual alcoves by geographical area: Western Turkish; Ersari Beshire; North and South Caucasian; Classical and Village Persian rugs and fragments. Jim says that the north wing now features a display of Turkish prayer rugs, and that rugs in other parts of the house also have been changed. If you haven't seen his recent display you should do so now as there will be a new group of rugs this summer. If anyone wants to see any particular part of his collection not currently on display, please let him know right away so there will be time to retrieve them for patio viewing. The event begins at noon on Sunday, April 18th, and runs until dusk (at which time the carpets take on a different hue). The event includes a delicious buffet luncheon. Please be prepared to remove shoes upon entering the house--you might want to bring slippers or an extra pair of socks. See you there! On June 17th, approximately 40 SFBARS members attended a "Show and Tell" session which included some wonderful storage-bags from the Poullada, Leiser, Mendelhall and Lave collections. Peter Poullada's collection of complete bags emphasized pieces with interesting gul-type designs. Pat Leiser's quite eclectic collection, ranged from the late 18th c. to the early 20th c. Her collection displayed a multitude of designs, sizes, and weaves. Some spectacular early pieces from the Bethany Mendenhall and Charles Lave collections included a 17th/18th c. large bag featuring "mother goddess" figures and also a wonderful Kilim piece. Richard Habib, our gracious host, invited us to sample a generous variety of Middle Eastern foods. A group of stunning modern Mamluk design Turkish rugs covered the gallery floor. On the back wall hung a handsome "Bird Ushak" which Mr. Habib speculated might be a Tuduk copy--a fascinating rug whatever its provenance. The Charles Lave and Bethany Mendelhall presented a short video of the 85 year old Josephine Powell in which she spoke of her full life--visiting Middle Eastern villages to photograph and collect ethnographic objects. SFBARS members were encouraged to "adopt" a kilim--a program to help preserve the important kilims she has given to the planned Center for Anatolian Ethnography and Textile Studies in Istanbul. The meeting ended with a very interesting and entertaining video by Harald Boehmer illustrating the Karakoyunlu (Black Sheep) and other Yoruk tribes in the process of weaving a large variety of utilitarian objects--from the commonly seen Juvals and kilims, to unusual items such as wall-hangings deliberately loosely woven to allow air circulation, and goat hair camel blankets, used to protect the animals from both from the cold and from chafing from the objects they must carry. June 17, 2004: Anatolian jijim and sumak storage bags at Alexanders in Mill Valley, featuring the Harold Boehmer Video on Anatolian nomads about the kilim, cicim and sumak weavings, and a presentation/Show and Tell on Anatolian jijim and sumak storage bags (what they call "Chul") with lots of examples from the Poullada and Pat Leiser collections. All members are invited to attend the showing of Harald Boehmer's second fascinating video on Anatolian Nomads and their weaving culture. This is a 45 minute film which follows up on the shorter one on felt-making we presented at Krimsa in January. In addition we will have a SHOW and TELL on Anatolian nomadic weavings presenting a selection of brocaded and tapestry decorated storage bags ( " chul " in Turkish ) from the collections of Pat Leiser and Peter Poullada. These bags which are used for bedding and for grain storage have been studied in a recent German book that shows the antiquity of the designs. They are colorful and truly ethnographic. Many are decorated with patterns that we can associate with Central Asian Turkmen as well as from Anatolia. In case anyone has ever doubted that many of the nomads of Turkey are of Turkmen origin these bags will help convince you. As part of the SHOW AND TELL we also encourage our members to bring in their favorite Anatolian nomadic weavings: these would typically be called just Yoruk, or " Kara-Kecheli," " Yunju, " " Yagjibedir " in the Istanbul Bazzar, or even Kara-Koyunlu. All the tribes mentioned and shown in this film belong to those nomads in Anatolia who call themselves " Yoruk" meaning traveler or wanderer. They are Turks ( not Kurds) whose ancestors having come from Central Asia to Asia Minor in several invading waves between 900 and 600 years ago. The Karakoyunlu form one of the biggest Yoruk tribes in Turkey but they are dispersed to different areas. The name Karakoyunlu means Black Sheep Tribe. In the 14th century the Karakoyunlu nomads together with other Turkish, Turkic ( and some Kurds) established the Karakoyunlu tribal confederation in eastern Anatolia and northwestern Iran. This tribal union was a political state based on nomadic power without fixed borders and without a capital city. It represented a symbiosis of dominant nomadic tribes and sedentary people. In the mid-fifteenth century the Karakoyunlu confederation was defeated and absorbed into the similar but even more powerful Ak Koyunlu confederation. The name Ak Koyunlu means " white sheep tribe." There are still Yoruks in Anatolia today who call themselves by these two names. Other Yoruk tribes shown in this film are the Karalar, Gebze-eli,and the Sarikecheli, but they do not all have the same glorious history: Sarikecheli means tribe with yellow goats. This tribe has huge flocks of goats and only small numbers of sheep. All the Yoruk live in winter ( the qishlaq) on the south coast of Turkey, mainly in houses although the Sarikecheli still use black goat-hair tents. Their summer pastures ( yayla) are in the Toros Mnts. The Karakoyunlu and Gebze-eli transport their tents and equipment in trucks or by tractor nowadays although about 80 families of the Sarikecheli still use camels. All these Yoruk do weaving. The Karakoyunlu, Gebze-eli and Karalar weave in August and September in their yayla when the milking season and the cheese preparation have come to an end. The Sarikecheli who migrate all summer with camels and stay only a few days at a time at one campsite do not carry looms with them. So they weave only belts which can be done without setting up a loom. For the Sarikecheli the main weaving season is during their stay in the qishlaq before the sheep and goats give birth to the kids and lambs. The Yoruk of Anatolia weave only flatweaves using vertical looms. They do not weave pile carpets, which are not normally a part of the traditional nomadic tent furnishing. They use both goat hair and wool yarns. They use undyed goat hair yarn in different natural colors: black, white, grey and brown. The Yoruk weave belts, storage and transport bags, grain sacks, floor covers camel covers, tent side walls and roofs. Sheep wool yarn is mostly used for the slit-tapestry weavings ( Kilim) both for large sizes and for bags, decorated storage bags and camel bags. One also finds brocaded or plain camel load covers and so called "namazlik" which are actually used to cover the bedding piles in the tents, not as prayer rugs. The Yoruk use sheep-skins for prayer. The large kilims in the old days were used to decorate the loaded camels during migration and then to cover the upper part of the decorated storage bags which form the back wall of the typical Yoruk tent. Nowadays the Yoruk use chemical dyes not vegetal and in fact the dying is done by the villagers not the nomads. With the rapid modernization of Turkey the traditional nomadic life and weavings from the nomadic setting will disappear in Anatolia within a few years. This Film is based on research conducted between 1992 and 1997. SFBARS is pleased to offer its first presentation for the 2004-2005 Season at the lovely gallery of Roger Cavanna in San Francisco's Jackson Square. The topic will be the well known and very beautiful pile weavings of the Jaf Kurds, a tribe that lives in the mountains of northeast Iraq and overlaps into Iranian Kurdistan. Most SFBARS members will immediately recognize their characteristic nomadic bag faces from their repetitive hooked diamond medallions (memling gul ) design, their fine wool and rich colors. The presentation will be a combination of expert commentary by Conroy Cavanna who has spent the last several years collecting, analyzing and studying these bags. He is in the process of preparing what is hoped to be the definitive article on these weavings for Hali magazine. A selection of fine examples from the Cavanna collection of Jaf Bags will be featured and we encourage and urge all attending members who have Jaf Kurd pieces or other similar pile weavings from the Kurds to bring them for what we hope will be an extensive and VERY hands-on Show and Tell. While their bags are well known there is not that much information on the Jaf Kurd tribe and their weavings to be found in the Carpet literature. Bill Eagleton, in his book An Introduction to Kurdish Rugs, tells us that the Jaf are one of the Kurdish tribes of Iraq, although there are also Jaf Kurds to be found in Iran, that in the early years of the 20th century they numbered over 10,000 families, mostly occupied in agriculture but with some remnants still practicing trans-humant nomadism, that is, moving from winter to summer pastures. Eagleton estimated that by the second half of the 20th century the Iraqi Jaf Kurds numbered several hundred thousand. Their main market town on the Iraqi side is Halabja, due east of Sannandaj (Senneh ), the famous center of Kurdish weaving of Iran. Sections of the tribe are further south and are sometimes referred to as the Kifri Jaf after the main town of that area. The ruling family of the Jaf Kurds is called the Begzadeh, who are believed to have entered the area in the mid 18th century with the nomadic Muradi section of the Persian Jaf tribe. Within a few years through conquest and land grants the Begzadeh Jaf took over a large area that had been inhabited by mostly non-tribal Kurds. Eagleton reported that the wealth of the Jaf tribe was based on the agricultural products of the well-watered Sharizur valley. No doubt it was also advantageous for them to be straddling the important borderlands between the Ottoman and Persian empires for both smuggling and legitmate commercial benefits. The famous British officer (and spy) Mark Sykes reported in 1908 that the Jaf were prolific weavers of pile rugs, and especially of their famous pile bags as well as kilims. However, by the second half of the 20th century most of their weaving abiliy had disappeared along with their semi-nomadic lifestyle. One tragic postnote on the Jaf Kurds: You may recall that Halabja and its Kurdish population was the focus of Saddam Hussein's ethnic cleansing campaign and the horrific poison gas attacks of the late 1980's. The Weavings: The most important and recognizable product of the Jaf Kurds is their pile storage and saddle bags. Eagleton says they were exported from Baghdad and Iran in the thousands to Europe and the USA in the first half of the 20th century. The older bags have clear vegetal dyed colors of red, green, several version of blue, subtle purples and brown. The newer ones have fewer colors and are darker with less use of white. A characteristic of these bags is the formation of the elongated diamond guls by slanting the knots one warp at a time rather than the normal two. Another sign of Jaf weaving is the twining and weft float brocade at the edges of the pile. Some of the bags are extraordinarily thick with a luxurious pile that is almost angora goat wool in quality, but in general all Jaff products use soft fine and lustrous wool. The Jaf always use symmetric knotting in the pile. While there are a few examples of main carpets using the hooked diamond gul the bag faces are the most typical. On first inspection it would seem there is very little variation or originality in the design of the Jaf bags, uncharacteristic for Kurdish weaving, which are famous for their lack of regularity. However, in the presentation and our Show and Tell we will learn to differentiate among different types and groups of these magnificent weavings. Bring your examples of Jaf or other Kurdish nomadic weaving for Show and Tell!! Situated in the high reaches of the Himalayan and Karakoram ranges, Ladakh has a textile tradition largely based on its own local resources of wool and pashmina. Weaving is found throughout the region through the practice differs between central and western Ladakh, where agriculture is widely practiced, and the nomadic pastoralists of the north-east. In the former, weaving is exclusively men's work and a foot loom is used. In fact, in these same areas women are not permitted to weave. This is unlike the north-east, where both men and women weave, each on a different loom. Ladakh has also been at the crossroads of the transmission of goods and ideas for several centuries, and textiles have entered the region through trade: cotton and silk from India, saddle-covers from Bhutan, carpets from Tibet and Yarkand, brocade from China. These textiles were expensive and symbols of prestige. They were mainly used and worn by the royal family, aristocracy and the clergy. This presentation will look at the textile arts of Ladakh, examining the historic development of weaving in the region as well as the various kinds and uses of textiles made there. These include a variety of textiles made by the nomads such as saddlebags, tents, rugs, and capes amongst others, as well as the fabric for clothes made by professional weavers in central and western Ladakh. It will discuss the traditional weaving systems in Ladakh, and their symbolic representations and interpretations in Ladakhi life. It will also describe Ladakh's trade in textiles and illustrate the various uses of these imported fabrics. Monisha Ahmed has been visiting and writing about the Himalayan region of Ladakh since 1987. In 1997 she received her doctoral degree in Anthropology from the University of Oxford. The subject of her dissertation was the weaving traditions among the nomadic pastoralists of Rupshu in eastern Ladakh. This work has been published as Living fabric - weaving among the nomads of Ladakh Himalaya (Bangkok: Orchid Press, 2002). The book won last year's Textile Society of America's R L Shep Award for best book in the field of ethnic textile studies. The focus of her interest in Ladakh continues to be the textile arts of that region. She is cofounder of the Ladakh Arts and Multicultural Outreach Trust, a non-government organisation that works with the arts in Ladakh. She is also currently doing research on the trade and use of silk-brocaded textiles made for the Buddhist market in Benaras, as well as pashmina. She has been invited by Moesgard Museum, Aarhus (Denmark), to be a consultant on an exhibition on pashmina which will focus on nomadic livelihoods, trade and craftsmanship to open in 2006. We all like to think we know the difference between symmetric and asymmetric knotting, slit tapestry and plain weave, and other important contrasts in the structure of rugs. But how much do we really know? By popular demand SFBARS is proud to present what will hopefully be only the first of a number of talks and workshops intended to help our members, both novice and experienced, better understand the technical and material aspects of carpet and textile construction. This talk will focus on questions of conservation verses restoration and the gray area in between, repair. There will be discussion of several factors influencing our approach to the management of damaged textiles: their age, value, use, and condition, as well as availability of time and budget. In the process we will learn that by looking “under the surface” of a piece at its warps, wefts, knotting techniques, and dyes we can better understand how these physical aspects of a rug or textile create its structure and how best to maintain a piece’s integrity. Angela Risser, an experienced local Bay Area restorer and conservator, has been interested in the art and craft of textiles all her life. She attended Philadelphia College of Textiles and Science and after moving to California in 1995 apprenticed in the restoration and conservation of Oriental rugs and textiles. She now runs her own restoration business in which she practices her skills in woven structures and color matching. She is also skilled in textile display methods. Finally, she is a weaver who spins her own yarn. Ms. Risser has made successful presentations at rug conferences, most recently at ACOR in Seattle, where she had a lovely exhibit of dyed wool strands and demonstrated how natural dyes are made. To further your understanding of structures and techniques all of you are encouraged to bring samples from your collections for analysis and inspection, especially any weavings that might seem puzzling. Dr. Sommer is the author of the 1996 definitive study, The Kyrgyz and their Reed Screens. This book accompanied the landmark exhibition of the Sommer-Krieger Collection at the Philadelphia ICOC in 1996. As the catalogue to that exhibit tells us, the Kyrgyz as well as some Kazaks developed to the highest level of sophistication the decoration of tent screens, a technique of wrapping dyed wool around the individual reeds used to make the “qanat”, the walls of their tents. These spectacular patterned screens were called “chormaghan chiy” which means the “decorated” or “adorned reed screen.” In the Turkic languages of Central Asia the grass that is used to make the reed is called “chiy,” as is the finished product. The reed is a slender wild grass whose Latin name is Lasiagrostis splendens. The reed is gathered, dried, trimmed, and then skillfully wrapped by master weavers using dyed, unspun wool, creating remarkable patterns and designs reminiscent of the felts and flat woven carpets of the Kirgiz and the Kazaks. Dr. Sommer will talk to us about the three main types or uses of these screens. First, the Chormaghun Qanat chiy which acts as the outer wall of the domed tent, surrounding the trellis walls themselves. Second, the Chormaghun eshik Chiy which goes from the top of the doorway up to the dome wheel. Third, the Chormaghun ash-khana chiy, a space divider separating the hearth and central fire area from the women's or inner household area. This chiy serves an important symbolic function by separating the two zones of public and private (in the Turkic languages the “Tashki” and the “Ichki”). Our meeting will also be a chance for members to purchase copies of Dr. Sommer's book on Klavdiya Antipina and the Kyrgyz. He has kindly agreed that all proceeds from sales will go to the SFBARS Honorarium fund. Books will be available from 6:30 at a highly discounted price of $30.